Wave - A disturbance that carries energy through matter or space. Mechanical Wave - Any wave that requires a medium to travel through. Ripples on a pond travel through water. Earthquake waves travel through rock. Most waves are mechanical waves. Electromagnetic Wave - A wave made up of changing electric and magnetic fields, which travel at the speed of light. Do not need a medium - can travel through space. The bigger the wave, the more energy it carries. Tsunami - Huge ocean wave caused by an earthquake. Energy spreads out as the wave travels. Waves spread out in circles from their source. As the circle (wave front) gets bigger, the energy is more spread out. Total energy is the same, but any given part of the wave front is weaker as the wave moves farther from the source. Most waves are caused by vibrating objects. Vibration - One complete back and forth motion of an object. Electromagnetic waves are caused by vibrations of charged particles. Simple Harmonic Motion is a type of vibration where forces try to move the object back to its resting place. In the example at right, the more the spring is stretched or compressed, the stronger it tries to go back to its resting position. The mechanical energy changes back and forth between KE and PE, but the total energy doesn't change. As particles move, they pass energy to neighboring particles, and the wave travels though the medium. Like shaking a rope - as one part of the rope moves, it pulls on the next part, and so on. The particle motion is perpendicular to the wave motion. Have crests (high points) and troughs (low points). Doing "the wave" at a sporting event. The particle motion is parallel to the wave motion. Have compressions (particles squeezed together) and rarefactions (particles spread out). The particle motion has a parallel-to-wave component and a perpendicular-to-wave component. This makes the particles move in an elliptical (oval) pattern. Occur at the boundary between two media (such as air and water). Amplitude - The greatest distance the medium's particles move from their resting position. Measures the amount of particle vibration. Transverse wave amplitude = distance from resting position to a crest/trough. Sine Wave - A transverse wave that has the shape of a sine curve (like an S on its side). Larger amplitude = more energy. Wavelength - The distance from a point on one wave to an identical point on the next wave. Transverse wave => crest to crest OR trough to trough. Longitudinal wave => compression to compression OR rarefaction to rarefaction. Represented by Greek letter: lambda (λ). Shorter wavelength = more energy. Period - The time it takes for a wave to pass a given point. The time it takes for one vibration of a particle. Frequency - The number of waves that pass a certain point in a certain amount of time. Humans can hear sounds in a range of 20 - 20,000 Hz. Frequency and period are related. The more vibrations that pass each second, the less time it takes each one to pass. Both equations work because of the relationship between frequency and period. Wave speed depends on the medium. Sound travels faster through solids than through water; faster in water than in air. This is due to how close the particles are. The speed of sound in a given medium is constant. Speed of Light (c) = 3.00 x 108 m/s (186,000 mi/s) in empty space. All electromagnetic waves travel at this speed. Humans can see light ranging in frequency from 4.3x1014 Hz to 7.5x1014 Hz. This is visible light. Electromagnetic Spectrum - All light at different frequencies and wavelengths. 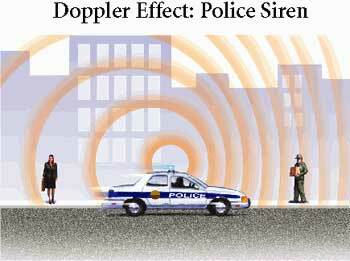 The Doppler Effect - An observed change in the frequency of a wave when either the source of the observer is moving. Pitch - How high or low a sound is. Determined by frequency of sound waves hitting your ear. Frequency changes when the source is moving. Higher frequency/pitch as the source comes toward you. Lower frequency/pitch as the source moves away. The Doppler Effect works on light => Red Shift/Blue Shift. It can be used to track storms. Reflection - The bouncing back of a wave when it hits a surface/boundary. Diffraction - The bending of waves as they pass an object or edge/opening. The amount of diffraction depends on the wavelength and the size of the obstacle/opening. Refraction - The bending of waves as they pass from one medium to another. Waves travel at different speeds in different media. All waves refract (bend) when they go from one medium to another at an angle. If they enter perpendicular to the boundary, they do not. Interference - The combination of two or more waves to form a single wave. Waves pass through each other, then resume their original shapes. Constructive Interference - When two or more waves overlap, in such a way that their amplitudes are added. ex. - Two wave crests overlap. Destructive Interference - When two or move waves overlap, in such a way that they amplitudes are subtracted. ex. - A wave crest overlaps with a wave trough. Interference of light waves produces swirls of color (like on a soap bubble). Some light reflects off the surface of a bubble, some goes through and reflects off the inner surface. The two sets of reflected light interfere constructively and destructively to make color swirls. Interference of sound creates beats. Sound waves from two different-frequency tuning forks interfere. Constructive interference makes the sound louder, destructive makes it softer. This makes beats. Tuning forks help tune instruments - when there are no beats, the frequencies are the same. Standing Wave - A vibration pattern that makes a wave appear to stand still. Actually, two waves moving in opposite directions that interfere precisely. Node - Place on a standing wave with no vibration (destructive interference). Antinode - Place on a standing wave with maximum vibration (constructive interference). Polarized Light with Grandpa John! Polarized Light without Grandpa John.